Russell and Kitty here. It is Stretch Tuesday again so let’s finish with our topic of Fenton’s Rib Optic. With the beginning of fall and all of the yellow leaves on the trees, we chose Fenton’s “Rib Optic” pattern for this week’s discussion. The Rib Optic as well as the Curtain Optic pattern dates from around 1926. Victoria Topaz is the color Fenton called this topaz opalescent color. 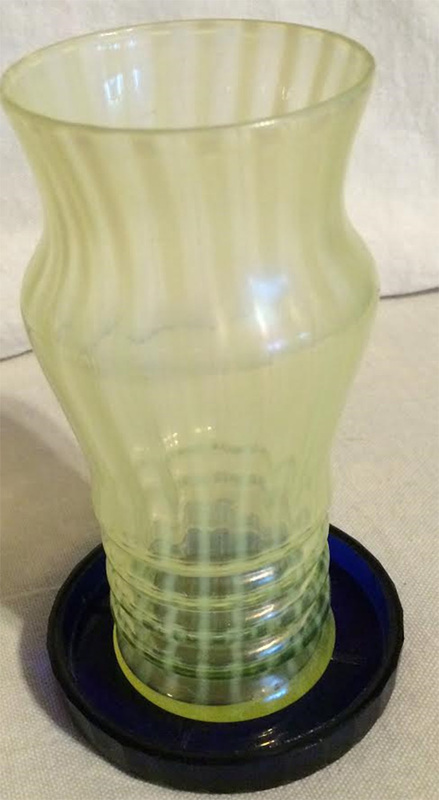 Some collectors also call this pattern ‘Stripped Opalescent Stretch Glass’. Many of the pieces have an applied dark blue handle and/or a rim of applied dark blue glass or a topaz handle. The Rib Optic as well as the Curtain Optic pieces have 4 rings or concentric ribs on the base of the glass. The pitchers and vases range in size from 10 1/2” to the milk pitcher at 8 1/2”. 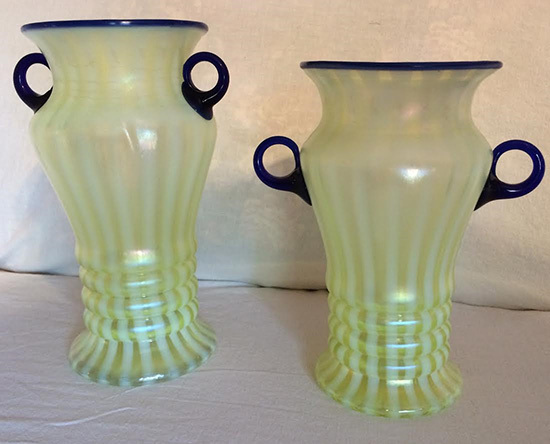 The pitchers and the vases were made from the same mould. Just a word of advice; don’t handle any of the applied handled pieces by the handles- you might wind up with 2 pieces of glass which is not good! The applied handles are very fragile. Something to look for is small fractures or stress lines where the handle is applied to the pitcher. 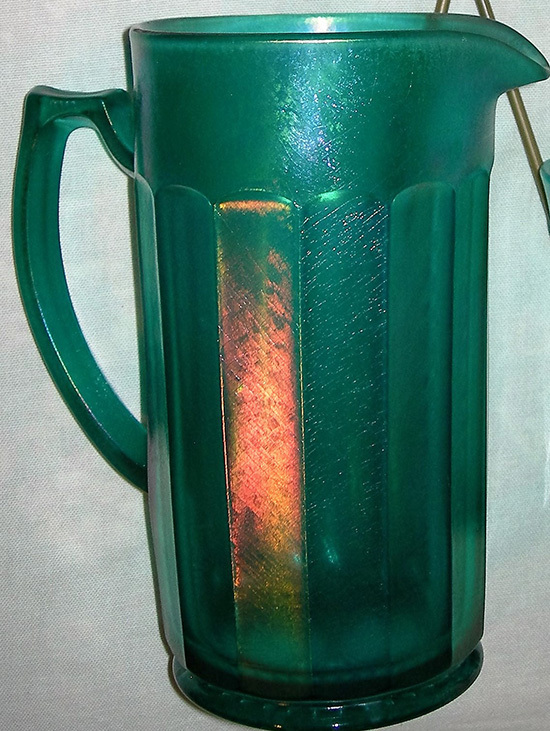 The Imperial teal pitcher above has a molded handle which means the handle is the same piece of glass as the pitcher (sometimes the handle is not iridized). There are mold seems on the handle. Because the handles are part of the pitcher, they can be used as handles. All true fruit and “cookie” (small bite sized cakes in the teens and twenties; they didn’t have cookies as we know them today) have molded handles which can be safely used as handles. The Rib Optic handles in the second and third pictures are applied handles which means that they are applied by hand after the piece is made. 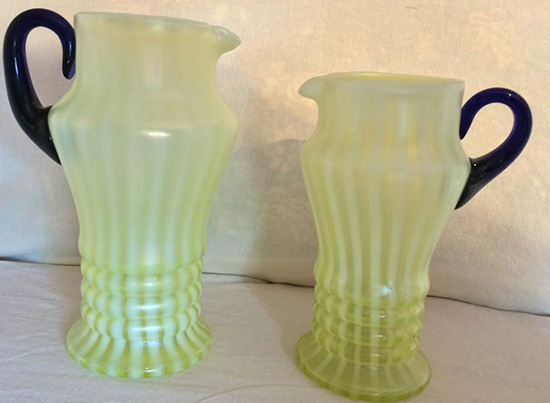 Applied handles can break off the pitchers and then you have vases with spouts! Because the applied handles are put on after the piece is made, no two are exactly alike. Look at the pieces in the 2nd and 3rd pictures, all of the handles are different including the two handles on each vase. So please do not ever handle a hand applied handle on pitchers, vases, tumblers, etc. as they may break off. PS: Don’t forget the 2016 N.C.C.C. Convention September 29 – Oct. 1, 2016 in Fresno, CA. We are a small group, but we have lots of fun and super glass for display and for sale. Tom Burns always brings out a wonderful collection of glass for his auction on Oct. 1. Contact Jeanne Hand at nccchand@yahoo.com for more information.